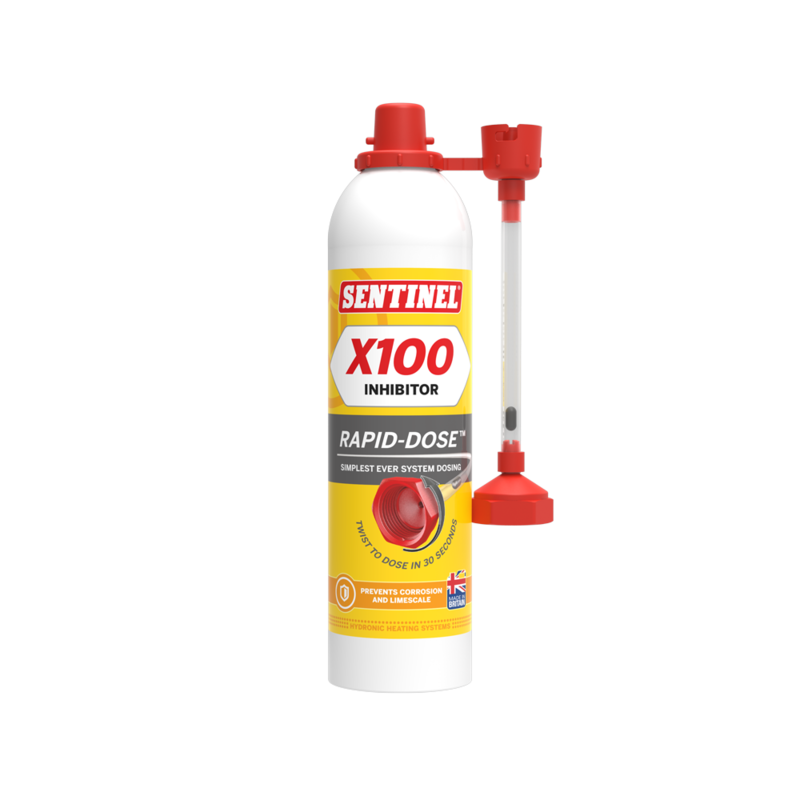 Sentinel X100 Inhibitor provides protection for clean hydronic heating systems against limescale and corrosion. 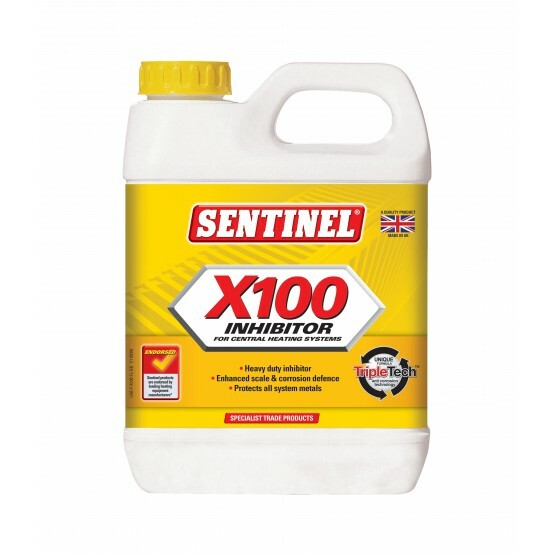 Suitable for use in all types of indirect heating system, Sentinel X100 Inhibitor will extend the life of the system, ensuring maximum efficiency and minimising fuel usage. *It is only necessary to release system pressure when it is above 33 p.s.i (2.3 bar). Limescale and corrosion are the two main causes of hydronic heating inefficiency, leading to radiator cold spots, boiler inefficiency, a noisy system and a number of other problems. 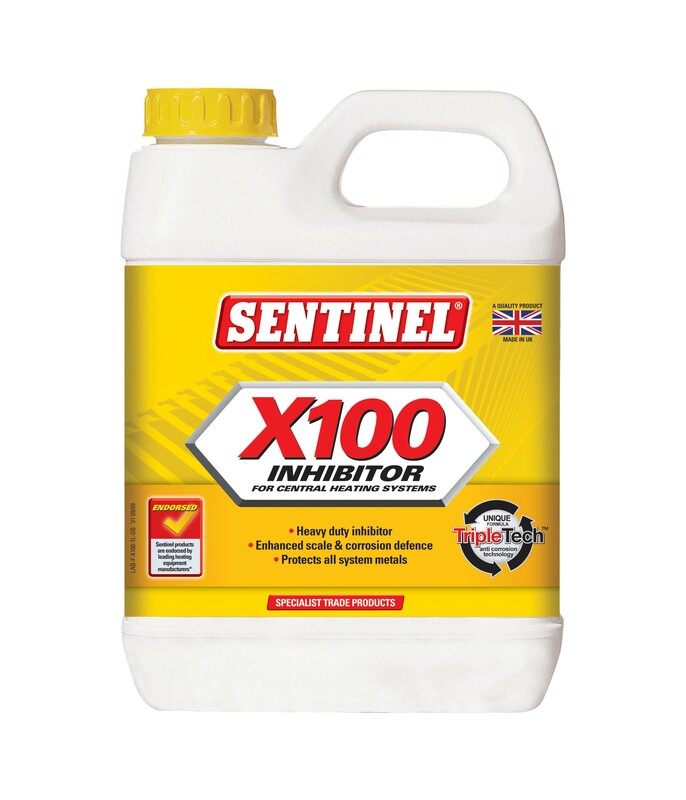 Once a system has been prepared using one of the cleaners from the Sentinel cleaning range, it should be protected with Sentinel X100 Inhibitor to prevent limescale build up or corrosion. 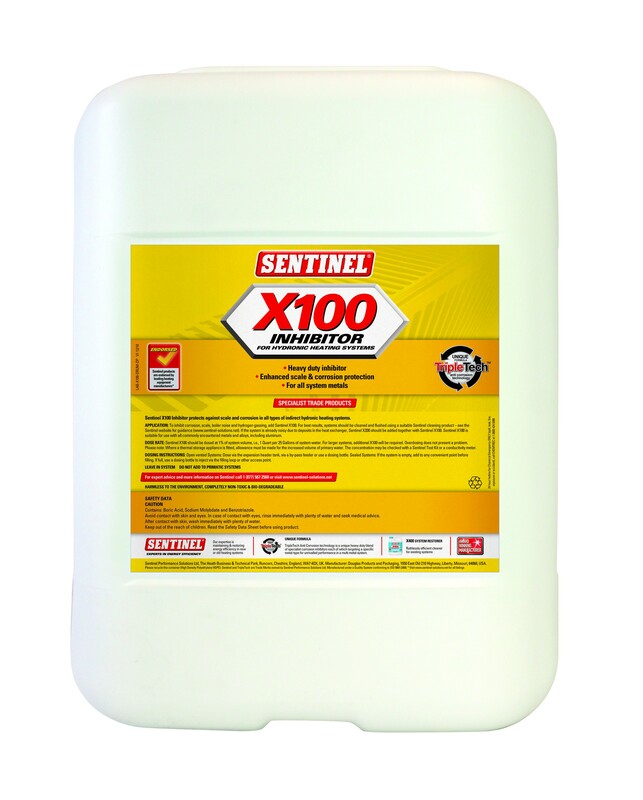 Sentinel X100 Inhibitor has TripleTech™ Anti-Corrosion Technology, a unique blend of heavy-duty specialist corrosion inhibitors. 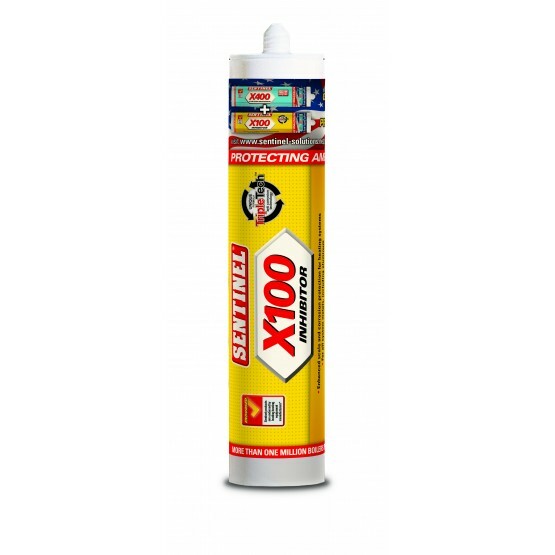 Since hydronic heating systems are often made up of a variety of metals, each of these specialist inhibitors provides protection for different metals, delivering unrivalled performance in protection for multi-metal hydronic heating systems. 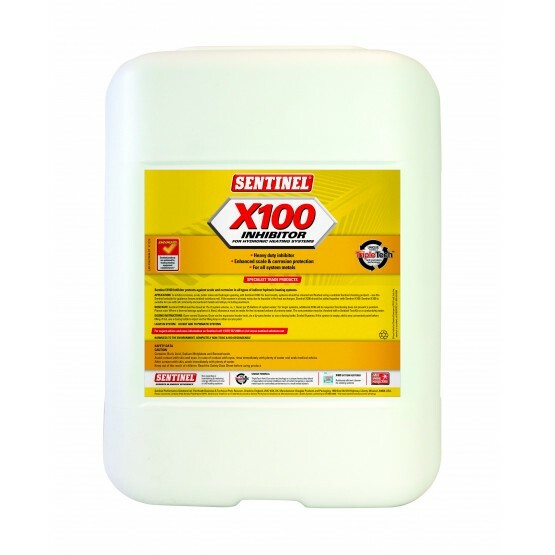 1 Quart or 1 275ml/9.3fl oz cartridge of Sentinel X100 is sufficient to treat a typical residential system of 25 Gallons. Larger systems should be dosed at 1% of system water. For best results, systems should be cleaned and flushed with clean make-up water. New systems and those up to 6 months old with Sentinel X300, existing systems with Sentinel X400. 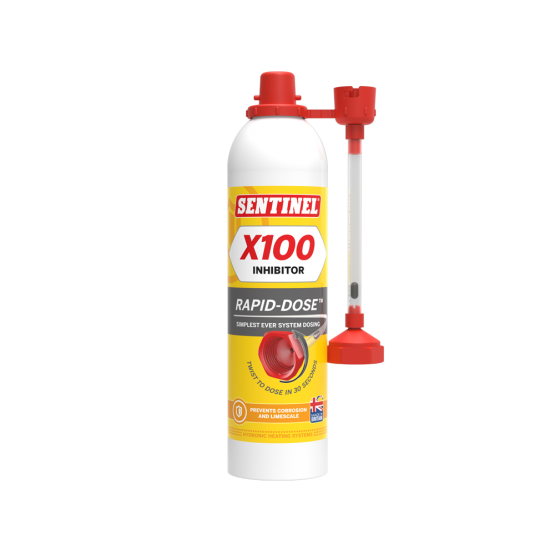 If the system is already noisy due to limescale deposits in the heat exchanger, Sentinel X200 should be added together with Sentinel X100. When using a concentrate cartridge, the product may be added directly to the heating system either via an air bleed valve, or via the fill loop using the appropriate adaptor and a suitable caulk gun.